Creating agiotage around your brand will give you the opportunity to transform the attention received into the fans/customers, and therefore into profit. What does it take? How does one convert attention into customers and consolidate these customers’ habit? First, let’s look at how they create agiotage on stock exchanges. For the Dutch, the tulip was and is the most beautiful flower, although this plant originates from the mountains of Kazakhstan. Given that in the 17th century, many Dutch people had a passion for gardens, it is not surprising that a little agiotage began around the rare species of tulips. Over time, more and more people involved into this speculative game; but this time not because of tulip bulbs, but because of the rising prices for them. The greed for rapid enrichment and the fact that the purchase and sale of tulip bulbs took place in the bars at the time, which in turn contributed to the weakening of critical thinking under the influence of alcohol, only increased the expansion of the market bubble, so we witnessed, in a way, the first significant stock market crash. For two years, since 1634, it has grown so much that the price for one rare bulb reached the value of a good house in the elite area of ​​Amsterdam. In the winter of 1637 the market bubble burst. Prices for tulip bulbs fell 10 times. It is worth noting that because in winter bulbs could not be traded (in winter they should be in the ground, so as not to deteriorate), futures contracts were introduced. That is, the tulip bulb remained in the ground, but the right to own it was transferred to another person. 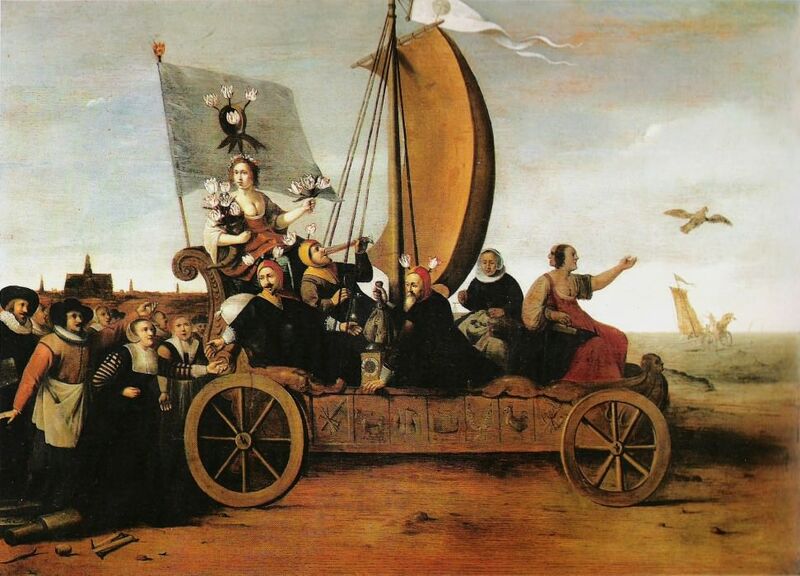 In Flora’s Wagon of Fools by Hendrik Gerritsz Pot, the goddess of flowers leads the weavers of Haarlem toward the rough seas that will destroy them. We see something like this in financial markets now. I described the way Forex brokers lured non-professional customers who are looking for quick and easy money. High volatility gives players in such markets the confidence that they will definitely be lucky. What is the basis for such an agiotage? It’s the trust to the market and the belief that the price will rise. But there is always the risk of “black swans”, as it was on June 22, 2017, when the price of the Ethereum cryptocurrency fell within a short time from $319 to 10 cents. What happened was a big player transacted a multi-million dollar sale of the cryptocurrency at a time which made the price fall from $317.81 to $224.48. This collapse in turn affected 800 automatic stop-loss orders, which lowered the price to 10 cents. Underestimation of risks and excessive optimism is a well-studied cognitive bias. It is present in all spheres of our life. For example, in finance there is such a thing as subprime lending. Subprime lending is the provision of loans to customers with poor credit ratings, that is, to people who have obvious financial problems. But what makes people with financial problems take expensive loans (for example, to buy a house)? The tendency to underestimate the exponential growth of an asset’s value over time due to neglecting compound interest. It is called exponential growth bias. The agiotage is built on fear of missing the gain. Evolutionally, it was important for us to keep what we had got; so in behavioral economics, we come across a notion of loss aversion. It has been experimentally proven that it is more important for us not to lose $5, than to get $5. But at the same time, we are ready to take a certain risk, as people tend to overestimate small probabilities and underestimate the large. We are wired evolutionally to have both an interest in the new and an avoidance of it. Evolutionary psychology explains this by saying that on the one hand we need to survive, so it’s better for us to stay away from the unknown. But on the other hand, we need to pay attention to something new, again, in order not to miss a possible danger. What happens when a crowd of people looks in one direction? We’ll automatically do likewise. Our unconscious mind is set up in such a way that it is easier to spend a little energy to look in the direction everybody looks into, than to miss the danger. So, along with the high social character of our species, it results in our tendency to follow the majority in our actions and opinions. There is even such a thing as the fear of missing out or FoMO. It’s an obsessive desperation to keep up to date with those around you so as not to miss anything important. In this syndrome lies the success of social networks. The basic desire for being social is embedded in our DNA and is pretty tightly controlled. For example, in suicidology it is believed that the main reason for formally healthy people’s suicides is the rejection of society and a lack of understanding of the rules of society. So we approached a very simple essence of creating agiotage around the brand. People should see that your brand is gaining popularity. It doesn’t have to be true. Many large PR strategies are being built on the creation of such impression. We made a number of different marketing strategies on the basis of this mechanism for totally unpopular brands. All is just a matter of imagination in this case. But drawing attention to yourself alone will not enable you to achieve an effective result. To do this, you have to directly apply priming, which will make people think about your brand in the right direction. By simple actions, we can prime people in order to significantly increase the likelihood of choosing the option we need. In my article on priming, I have already given examples of the way priming affects the decision-making process. Similar examples can be found in other articles of mine. So now I’m going to provide another example, which clearly demonstrates the impact of priming on people’s decisions. American researchers Hal Hershfield, Daniel Goldstein and their colleagues conducted the following experiment on young students at Stanford University. Researchers created 3D avatars of the test subjects representing them in old age. Participants had to engage in dialogue with their avatars discussing their lives in the future. In so doing, participants had to answer for their avatars as well, that is, from the perspective of themselves being in old age. The point of the experiment is that we often evaluate ourselves in the future as completely different persons. And the more we have such a perception of ourselves in the future, the less we care about protecting ourselves in old age. The result has been that the participants who had a dialogue with their elderly 3D avatars were inclined to invest twice as much into the retirement fund as the participants in the experiment who did not have a conversation with avatars. By the way, Professor of Psychology at Stanford University Kelly McGonigal sets this experiment as an example of one of the ways to increase the willpower. She also cites the example of economists who recommend using such avatars in people’s applications for large loans and even ordinary credit cards. Conclusion: If you want to create agiotage around your brand, you have to take advantage of the evolutionary feature of our brain to follow others. When you make your brand appear to be gaining popularity, people cannot help but begin to take an interest in it. But after you got attention, it is important for you to promptly create for people an attractive idea of your brand. This is being done through priming. And further you can take on the habit creation. I’ve already written about the habit creation in detail. How do we apply it for a football club? A full-fledged campaign should work both through the media (including the work with opinion leaders), and involve more unique solutions. For instance, the strategy that I came up with for the New York Cosmos involved creating a flash mob with a non-typical scenario, a PR strategy able to create a link between the brand of the club and the topic important for many New Yorkers, etc. With an increase in the budget, you can arrange exciting events in the field of cause-related marketing (social marketing the brand benefits from). It is especially encouraged by developed countries. Do you want help in creating a successful strategy or get a consultation on another issue? Write to me at E-mail leon@sportsneuromarketing.com, and we will reply within 24 hours.